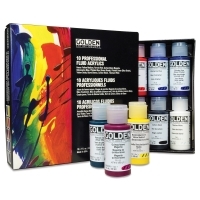 Golden Fluid Acrylics are highly intense, permanent acrylic colors with a consistency similar to heavy cream. Produced from lightfast pigments, not dyes, they offer very strong colors with very thin consistencies, and contain no fillers or extenders. 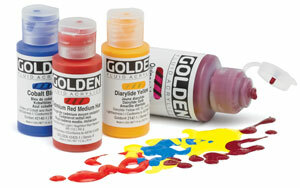 Golden Fluid Acrylics are ideal for spraying, brushing, and staining. Golden Artist Colors, Inc., started creating Golden Fluid Colors on a custom basis for artists requesting a low-viscosity, pigment-saturated paint. Some of these artists wanted to pour, puddle, and drip their acrylic paints, others wanted to stain, using the acrylics as an alternative to watercolors, and still others wanted to use the paints for spray application. Many artists were already thinning Golden Heavy Body Acrylics with water to achieve these effects. Although simply adding water or medium met the needs of most artists, some felt the resulting paint was not strong enough. These artists desired an undiluted acrylic paint that would provide optimal tinting strength and coverage. Eventually, the popularity of Golden’s Fluid custom formula reached a point where the company was able to introduce it as a standard line of products. Unlike mixtures of heavy-bodied paints and water, which produce weak color and films by dilution, Golden Fluid Acrylics contain high pigment levels suspended in an acrylic polymer vehicle. The result offers fine dispersion, high tinting strength, durability, flexibility, and good adhesion. Golden Fluid Acrylics are formulated similarly to Golden Heavy Body Acrylics, the main difference being the viscosity or consistency at which the paints are finished. Therefore, the pigment load or color strength of Golden Fluid Acrylic paints is comparable to Golden Heavy Body Acrylics. In fact, because of the greater leveling of Fluid Acrylics, some artists believe Golden’s Fluids are actually stronger than the Heavy Body colors. Golden Fluid Acrylics load a brush more evenly than thicker paints, and they flow consistently off the brush, allowing for longer, more uniform brush strokes. When a heavier stroke is required, the Fluids can be blended with any of the Golden Gel Mediums. Soft, Regular, Heavy, or Extra-Heavy Gels will all thicken the paint to various extents. Because of the thin consistency and potency of Golden Fluid Acrylics, they are the easiest of all the paint systems to incorporate into powerful gel mixtures. Golden Fluid Acrylics retain excellent flexibility when dry, greatly diminishing the likelihood of cracking that occurs in other natural and synthetic polymer systems. They also can absorb the constant stress and strain placed on canvas when shipped or as it expands and contracts with changes in temperature and humidity. Set of 8 — The colors in this set are recommended for color mixing, tinting, and shading. The set includes Benzimidazolone Yellow Medium, Naphthol Red Light, Quinacridone Magenta, Phthalo Blue (Green Shade), Phthalo Green (Blue Shade), Yellow Ochre, Zinc White, and Titanium White in 0.5 oz (15 ml) bottles. A Golden Fluid Acrylics application guide is also included. Professional Fluid Acrylic Set of 10 — This set features 10 essential colors for building your palette. It includes Benzimidazolone Yellow Medium, Burnt Sienna, Carbon Black, Phthalo Blue (Green Shade), Phthalo Green (Blue Shade), Pyrrole Red, Quinacridone Magenta, Titanium White, Ultramarine Blue, and Yellow Oxide in 1 oz (30 ml) bottles. Golden Fluid Acrylics were created for a more aqeous acrylic paint appication but with the same pigment intensity of the heavy body paints. No more thinning out your color for fluid painting techniques!